Spring Airlines is China’s only notable (international) low-cost carrier and a successful one at that, having recently taken delivery of its 35th aircraft. One of China’s few private carriers, it is still a third the size of the AirAsia or Jetstar Groups, but that is largely a result of Beijing’s tight control of fleet growth. No doubt without this restriction Spring would grow even faster. In 2013, when Spring will carry more than 10 million passengers for the first time, the carrier will look to expand its presence in Hangzhou, 90 minutes west of Shanghai and boasting incomes higher than those in China’s financial capital. Spring’s expansion announcement was quickly followed by competitors Air China and low-cost Juneyao. While the domestic market remains the staple for Chinese carriers including Spring, Spring has expanded regional routes to Hong Kong, international services and is looking to establish a subsidiary in Japan to accelerate growth. 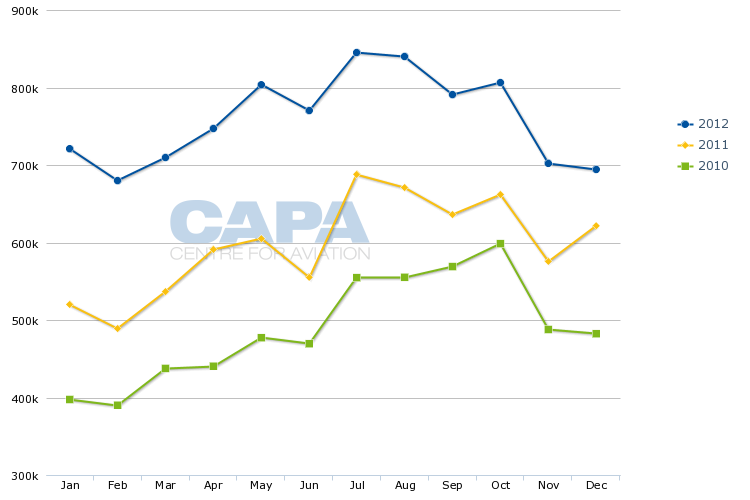 Spring has outperformed the Chinese market. 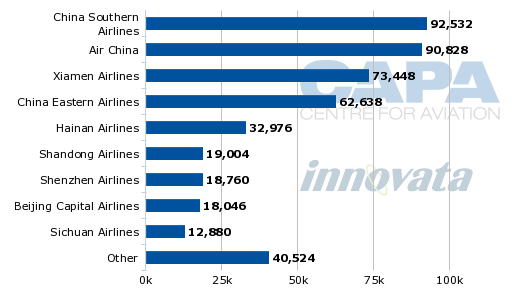 Chinese regulator CAAC reported that overall passenger numbers increased 9.2% in 2012, including 9% in the domestic market, 9.7% on regional (Hong Kong, Macau and Taiwan) routes and 10.7% on international routes. 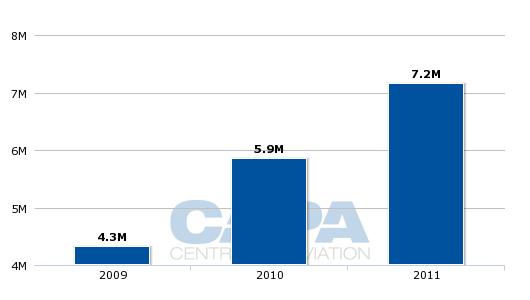 Spring’s overall passenger numbers in 2012 were three times the national average, increasing 27.4% to 9.1 million. 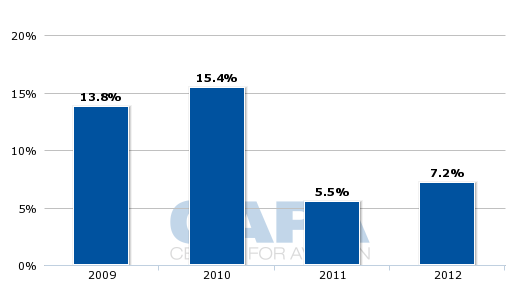 This followed 22% growth in 2011. 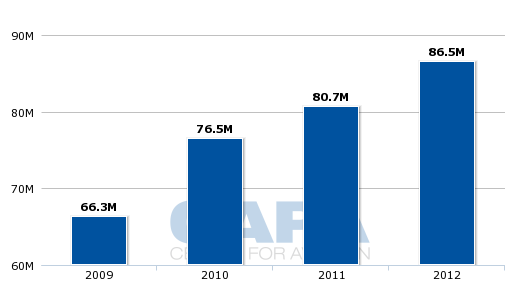 Spring hoped to break the 10 million mark in 2012, but this did not occur due to slowdown in late 2012 associated with China's once-a-decade leadership transition, which reduced many businesses, and thus travel, to a slow pace. Spring is China’s 12th largest domestic airline but growing much faster than China’s so-called “Big 3”, the state-owned carriers that account for the majority of traffic: Air China, China Eastern and China Southern. The carriers are weighed down with inefficiencies, a result of factors including clunky mergers last decade and their state-owned status stifling agility. The domestic market is tightly controlled in China with each carrier effectively given a fiefdom and needing approvals for each new route. It took some years before Spring was able to enter the trunk Beijing-Shanghai route, and even then was given less than desirable slots. Continuing Beijing-mandated pricing restrictions and its rejection of the full LCC concept domestically means that Spring is only able to apply full pricing flexibility on international routes. One option being explored by Spring, with its lower cost base, is to expand domestically with a two class service too, thereby exploiting effectively the higher yields to be had in this environment – but while retaining its pure LCC mode internationally. With its growth and potential held back by regulatory bodies, an unshackled Spring would be overwhelming for the legacy incumbents. As it stands, China Southern is trying to learn from partially-owned subsidiary Xiamen Airlines on how to be more efficient (Xiamen is, by its calculation, the world’s most consistently profitable carrier). China Eastern meanwhile is absorbing wisdom from Jetstar, its erstwhile partner in Hong Kong's first LCC. Competing with Spring would represent a new leap, and one the bigger airlines could not tackle for some time. Spring in corporate presentations notes travelling staff eat cup noodles and share hotel rooms to keep costs low. Led by formidable CEO Xiuzhi Zhang, Spring is known to move into new markets quickly, aggressively target new ancillary revenue streams and have a large social media and customer service presence – the latter not to be overlooked in a domestic market where tensions are increasingly growing, partially due to further congestion and delays. Even if China’s market is not liberalised overnight – which it will not be – gradual changes will be to Spring’s benefit. Soon too it should benefit shareholders: the carrier is waiting to list on the Shanghai stock exchange. Besides matters like slot and route access, Spring has spoken of loosening regulations so it can fly domestic overnight services, increasing utilisation of its all-A320 fleet and driving costs down. Any organisation that is able to become an airline in China clearly curries favour with the power halls of Beijing and regional governments too. But its growth is tied to continued political support. Even state-owned China Southern is encountering some troubles with deploying its A380s. Spring Airlines in Mar-2013 announced the establishment of a new base at Hangzhou. Ninety minutes west of Shanghai on the high-speed rail, it offers alternative airport access, but Hangzhou has its own catchment area whose population has incomes higher than even Shanghai. The area is also a major tourist draw, further sustaining its own traffic (AirAsia X for one serves both Hangzhou and Shanghai Pudong). Spring’s growth – and that of competitors who followed – has been facilitated by infrastructure expansion at Hangzhou Xiaoshan International Airport, which opened its second runway on 10-Jan-2013. The 3,400x60m runway is part of the airport's CNY10.2 billion (USD1.6 billion) phase two expansion project, which included the opening of a new domestic terminal (T3) on 30-Dec-2012. The airport is only 12 years old and ranks 10th in the domestic Chinese market and 73rd globally for available seats. With the completion of the terminal and runway, the airport is 10 square kilometres in size, has runways capable of handling the A380, a terminal space of 370,000 square metres (3.7 times the original size) and tarmac area of 900,000 square metres (2.6 times the original size). The airport is designed to support 33 million passengers and 805,000 tons of cargo and mail annually from the 260,000 annual slots, according to the airport. The spooling-up from a 10-Jan-2013 runway opening date to additional slots being available from 31-Mar-2013 indicates the lag that can occur in China. Curiously, slots for the new Hangzhou services from Spring as well as Air China and Juneyao are placed between 07:00-08:00, 12:00-14:00, around 19:00 and then late evening, suggesting the additional runway alone cannot facilitate expansion. 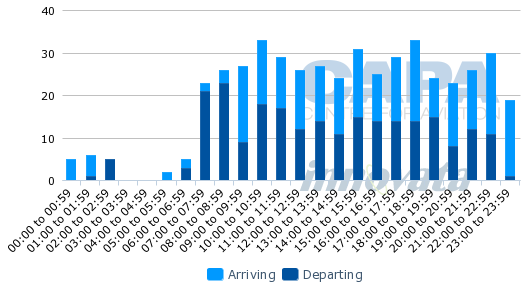 Those times the new services are generally departing from see fewer movements than at other hours. Other new services from Hangzhou include China Southern’s four weekly Hangzhou-Nanning from 31-Mar-2013 and Hebei Airlines’ daily Shijiazhuang-Hangzhou-Sanya from 18-Feb-2013. Additionally, China Eastern expects to open in Mar-2013 a new 1,000 sqm lounge at Hangzhou terminal three. 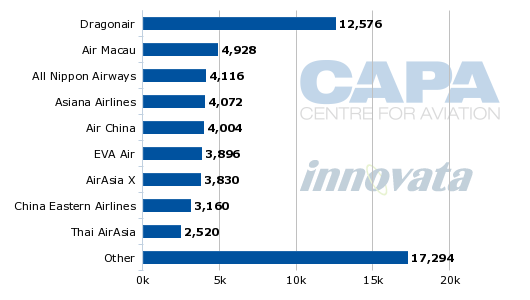 China Southern, Air China, Xiamen and China Eastern are currently the largest domestic carriers by far at Hangzhou Airport. Top destinations are Beijing, Guangzhou and Shenzhen. International capacity is dominated by Dragonair, the regional and wholly-owned subsidiary of Cathay Pacific. Outside traditional growth, Spring is embarking on a pan-Asian strategy with the launch of a Japanese subsidiary, planned for later in 2013. In accordance with Japanese aviation ownership policies, Spring will have a minority shareholding in the carrier, a joint venture with undisclosed parties. Likely to be based at Tokyo Narita, the home of new LCCs AirAsia Japan and Jetstar Japan, Spring’s Japanese subsidiary will offer domestic routes and regional services, but the biggest focus will be on services to mainland China, some destinations that Spring could not link with Japan on its Chinese AOC. The Japanese base (undecided but possibly at Narita) will enable Spring to more easily serve other Chinese cities. "If we can set up a company in Japan that can pick up passengers from China, that would be good for us," Spring CFO Johnny Lau said at CAPA's Financing the Asian Revolution in Macau on 7-Sep-2012. In addition to any Chinese regulatory issues (outside of sheer air rights; China and Japan recently agreed to an open skies agreement) on further international expansion, flights on Spring's Chinese AOC from cities other than in its bases/focus cities – Shenyang and Shijiazhuang – could require a branch company to be established, adding costs. While a Japanese affiliate will have higher costs on China-Japan routes than Spring's Chinese AOC, the affiliate may be the only way to access those markets. Additionally, while Spring is lean compared to Chinese legacy carriers, government restrictions – such as personnel structure – have prevented Spring from achieving as much efficiency as it would like or would be possible in other markets; it averages approximately 160 staff per aircraft. So Spring may not be as low-cost on the labour side as one would assume for a Chinese carrier (plus salaries are rising across the board at Chinese carriers, often with double-digit increases). Mr Lau said Spring will also have a domestic network. This is partially due to the regulatory time required to be approved for international services, with China typically taking longer than other countries. The short and medium term focus for the Japanese subsidiary will be domestic services and flights to China with Mr Lau saying that after a few years the Japanese AOC will also consider international flights to countries other than China. A launch date is not set yet, but the ownership of the affiliate will include a minority shareholding from Spring (as is common elsewhere, majority foreign ownership is not permitted) with the remaining held from non-airline Japanese companies. AirAsia Japan and Peach Aviation have ownership ties to ANA while Jetstar Japan has ownership ties to JAL. 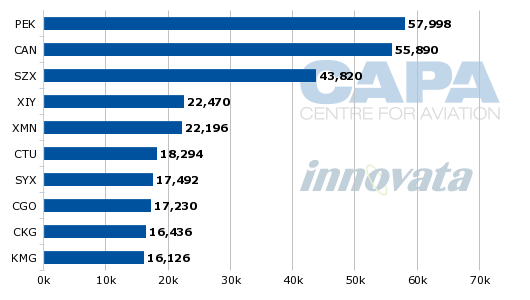 Spring’s all-A320 fleet numbers 35 with three additional aircraft on order, although this is not entirely indicative of future growth as aircraft purchases are made public only about two years out. 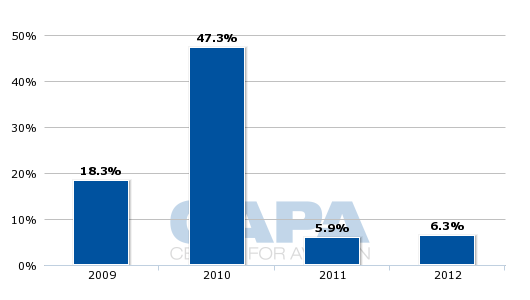 Spring relies on lessors with 66% of its fleet leased, according to CAPA’s fleet database, but Spring expects this percentage to decrease as it grows. Its average aircraft age is 3.6 years. While the domestic market will be the largest market for Spring Airlines, the carrier is expanding regionally, targeting popular Southeast Asian leisure destinations and Japan, although the latter has been a difficult market since political tensions flared in Sep-2012 and traffic fell sharply as a result. Spring has also mounted a notable expansion in the Hong Kong market, opening four new routes at the end of 2012, bringing its destinations from Hong Kong to seven. Domestic yields are typically the strongest for Chinese carriers, after yields on services to Taiwan. Spring’s growth has been followed with profitability. While its exact 2012 figures are not yet available, the carrier says its profit grew 40% while the Chinese market on average saw 50-60% declines (this is partially due to Spring's travel agency boosting profits). Ms Zhang said Spring's profit before tax has been above the industry average for the last four consecutive years including a profit before tax of USD3.9 million compared to the industry average of USD2.3 million in 2011. The carrier also reports average load factor of 94% at present, compared to China’s national average of 81% and aircraft utilisation of 11.4 hours, compared to the national average of 9.3 hours. 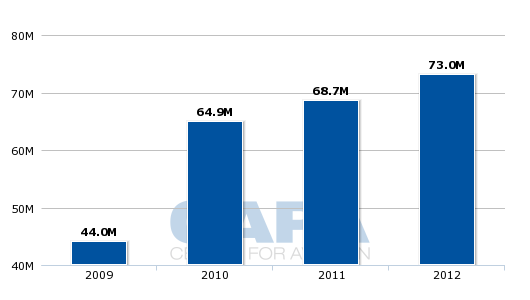 Spring's cost per ASK in 2011 was USD5.12 cents, compared to peers average of USD7.19 cents. While Spring has not realised its full potential, that is not of its doing. Spring’s existence will force the Chinese market to become more efficient, which will subsequently allow Spring greater expansion. For all Spring’s success so far, this is still the warm-up act.